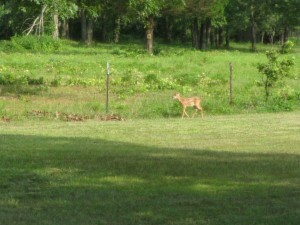 Heather Marie spotted this beautiful little fawn right outside our covered porch on the side of the house. 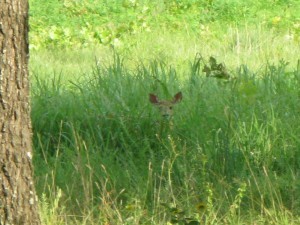 It couldnt have been more than 30 yards from the house. She grabbed the camera and smapped a few. Upon moving into our new Homestead, we noticed a couple of trees down. I absolutly did not want them to go to waste, so one of our first chores was cutting them up and having our own winter wood supply. Upon moving into our new Homestead, we noticed a couple of trees down. I absolutly did not want them to go to waste, so one of our first chores was cutting them up and having our own winter wood supply. Luckily for us, our home is designed with a super efficient geothermal system for heating and cooling. 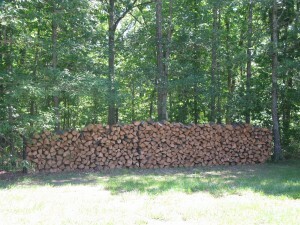 Since the system is efficient we dont have to depend on wood as our only source of heat in the winter. Having a fire place and wanting to be self reliant, it made perfect sense to cut it all up and stack it. 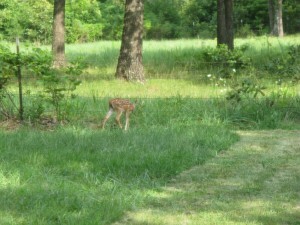 I opted to put it at the edge or our wooded tree line near the back of the house. What the picture doesnt show is I actually have another smaller stack behind it. We also had the great fortune to have a walk in closet designed in the house for wood storage. The walls are covered with metal plate to keep from breaking thru the drywall. It is actually a very nice setup. So we filled that with wood as well. We have gathered burn piles, for the branches that are too small, and will be burning those in the next couple of days. Next time, I will have a wood splitter though!HAHA! Sure is a comfort knowing that if we loose or electricity we can still stay warm. 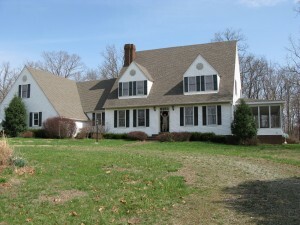 Introducing our Missouri Homestead and Homestead Basics home base! Id like to first start with an introduction to our place so you get a feel for what we are working with. We moved here in Apr. 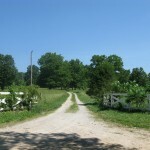 2009 with the intentions of going back to basics and learning the basic homesteading skills to pass on to our children. Since we have six kids, we decided on something with alot of room. The home is 5000sq ft and has a “oversized” two car garage. 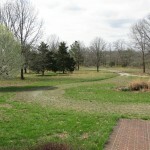 The house sits on 21 acres and has a pond, 5 horse stall barn, chicken coupe, and about 4 acres of trees. 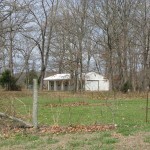 In the pic to your left you will see a covered porch to the right of the house. That has a hot tub and my hammock! Ahhhh, my wonderful hammock. 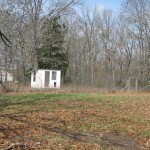 Some of the pics you can see overgrowth and some not so much. Some of these pics were taken today and some while it was winter in Jan.